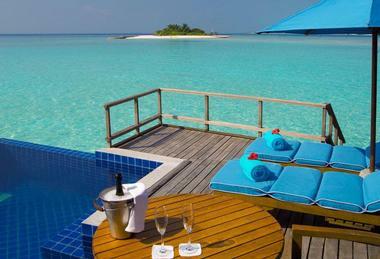 Choosing the right honeymoon getaway is as much about the accommodations as it is about the actual destination. Pick the perfect suite that will please both of you, and honeymoon bliss is virtually guaranteed. Top things to consider are the view, the layout and the bathroom design. Choose from romantic suites with spectacular ocean views, villas on a sandy beach and garden cottages surrounded by nature. Some of these getaways cater mostly to couples. Finding the perfect honeymoon spot is not just about the view, but also about the activities offered at the hotel and the surrounding area, such as dining options, nightlife and boutique shopping. Ample outdoor deck space is very important, as well as its setup with a dining table and a plunge pool or a Jacuzzi since most vacationers like to spend as much time outside as possible. Other unique features to look for are bath tubs with picture windows and ocean views. Here are world's best suites and villas in top destinations around the world, including the Caribbean Islands, the U.S., Mexico, Australia, East Coast, West Coast, Fiji and many more. 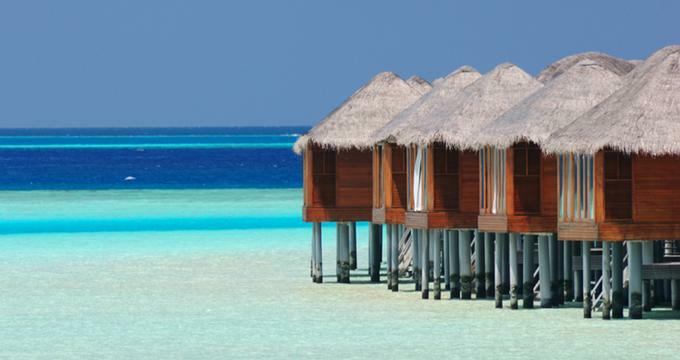 Located on a beautiful island with sandy beaches in the Maldives, Anantara Dhigu is a romantic getaway offering a selection of over-water suites. On your honeymoon, book one of the Deluxe Sunrise/Sunset Over-Water Suites so that you can have a view of the sunrise in the morning and a romantic sunset in the evening. Each luxury over-water suite has a private hardwood sundeck over the sparkling waters of the Indian Ocean. There is also a tub for two, perfect for couples. Jade Mountain is an all-suite getaway at Anse Chastanet Resort in St. Lucia, offering spectacular suites with their own infinity pools, perfect for a honeymoon. 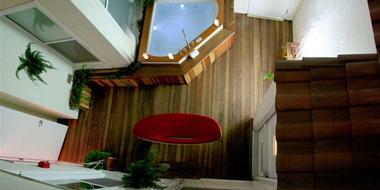 With sizes ranging from 400 to 900 square feet, the design is unique both in color and shape. Fiber optics illumination features individual settings which you can adjust to your taste. The property is a beautiful destination for couples. Enjoy complimentary yoga classes and diverse fitness options such as escorted walks and hikes on the 600 acre estate. 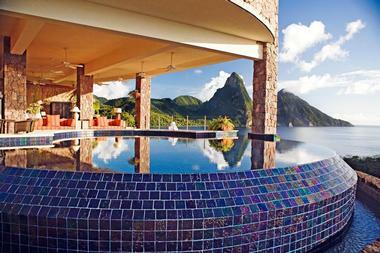 All suites have infinity-edge pools, spacious layouts and incredible views of St. Lucia's iconic landscape. Enjoy spectacular ocean views, nearly 3,000 square feet of living space, high ceilings and custom furniture in the E-WOW Suite at W South Beach. 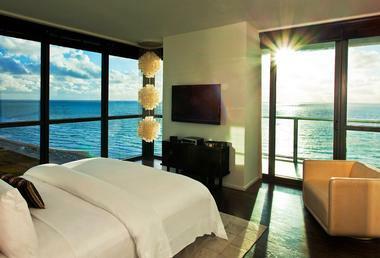 Floor-to-ceiling windows throughout the suite let you admire the view right from your bed. Have a romantic dinner on your private balcony, get a Bliss Spa massage and enjoy a number of VIP perks such as complimentary airport pickup, VIP concierge and admission to an exclusive nightclub. W South Beach has several bars and restaurants where you can have an elegant dinner or a casual meal. The hotel has a unique rooftop basketball and tennis courts where you can play a game with a view of the famous beach. One-bedroom suites at Little Dix Bay in the British Virgin Islands are nestled among sea grape trees and offer ultimate privacy. 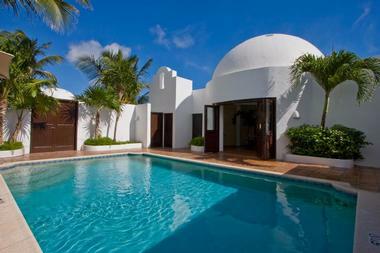 You can also splurge on a luxurious two-bedroom waterfront villa with a private pool and a dining pavilion. Pack your snorkeling gear since there is a coral reef just steps away. When you stay in the Luxury One Bedroom Beach Villa at Cayo Espanto, you get to see the ocean and the beach from every spot in the villa. 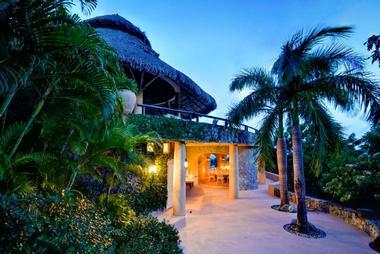 The villa is right on the water's edge, located on its own private stretch of beach. It has a private dock with an umbrella and lounge chairs, perfect for watching the spectacular night sky and relaxing in the sun. Eden Rock – St Barths is hands-down one of the best luxury getaways in the Caribbean when it comes to spacious layouts. You will feel like a rock star surrounded by individually selected furniture, art and luxury service. Choose from Caribbean-style Garden Cottages just steps from the beach, or the more spacious accommodations with two bedrooms and a private pool. The Fontaine Suite has one suite and one cabin, a terrace with its own private pool and plush deck sunbeds. Immerse yourself in nature and luxury at Calistoga Ranch in Napa Valley, California which offers 48 free-standing Guest Lodges with floor-to-ceiling windows and expansive cedar decks. Curl up next to the fireplace, surrounded by original artwork. 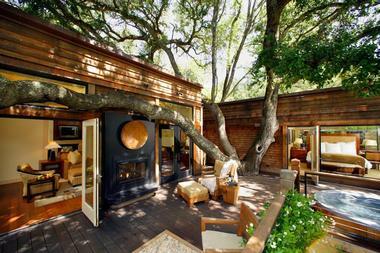 Head to The Bathhouse at Calistoga Ranch, a romantic spa which offers soothing soaking pools and restorative organic treatments. Book a couples' massage on your romantic getaway in one of the treatment rooms with an outdoor garden shower and a private soaking tub. 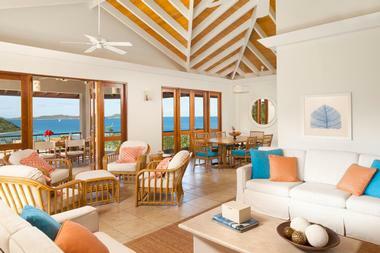 Mustique Island is famous for its sandy beaches and plush villas like Yemanja. In fact, the hardest part of the vacation is deciding which room to book since there are so many options. Make your selection based on the view (although they pretty much all offer spectacular ocean views), number of bedrooms and decor. 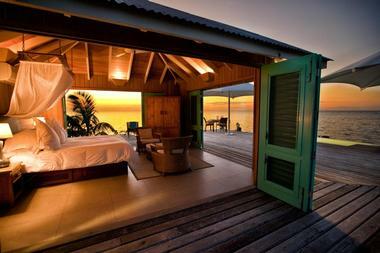 At Likuliku in Fiji, couples are accommodated in stunning villas set on stilts over a coral reef. The villas face the ocean, including the bathrooms where you can relax in the bath with a view of the blue lagoon. Argos in Cappadocia is one of the top wine resorts, set in an ancient monastery within Old Uchisar Village, Turkey. The resort is spread among six different mansions, including 51 rooms and suites, including several with private cave pools. Every room includes concierge and room service 24 hours a day, wireless internet, and iPod. Ask for a suite with a fireplace and a cave pool. The Bezirhane features occasional concerts and you can also choose to host your wedding at the resort. SEKI Restaurant creates contemporary dishes using fresh local ingredients that are complemented with wines made using the grapes from the resort’s vineyards. The SEKI Lounge is perfect for a snack or cocktail, while the SEKI Wine Cellar offers wine tastings. 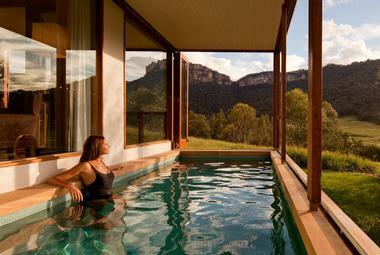 The luxury Emirates Wolgan Valley Resort & Spa in Australia's Blue Mountains is perfect for couples who love nature and conservation. Check into one of the suites which are really free-standing lodges with private pools, romantic fireplaces and huge outdoor living space. 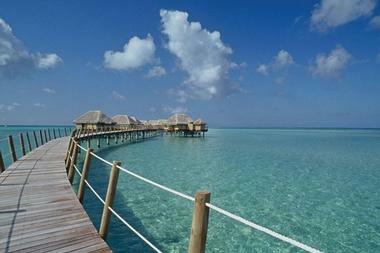 The islands of French Polynesia are famous for their azure lagoons, over-water bungalows and spas. Le Taha'a is a couples' dream, located 230 km west of Tahiti. 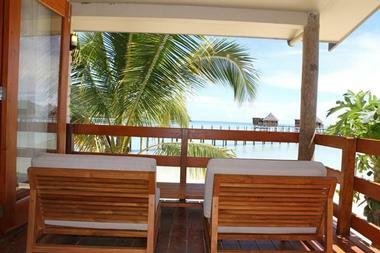 Book one of the over water bungalows, or indulge in a beach villa with a private pool. The Manea Spa offers a number of signature treatments and scenic ocean views. Book a couples massage and relax together. 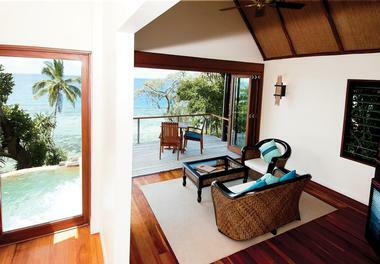 Royal Davui in Fiji is a private island getaway with just 16 villas, all with private plunge pool. The separate jacuzzi spa bath is a wonderful addition for those who enjoy long soaking baths. Couples can spend romantic evenings outdoors on the deck. There are two separate decks: a dining deck and a sun deck, offering plenty of space for outdoor living. 15.Suites with Water Views in Washington D.C. If you want to book a luxury suite with some of the best views in Washington D.C., take a look at the specialty suites at the Mandarin Oriental, Washington D.C.. Travelers enjoy spectacular city views from the Mandarin Suite which offers elegant decor with Asian accents. 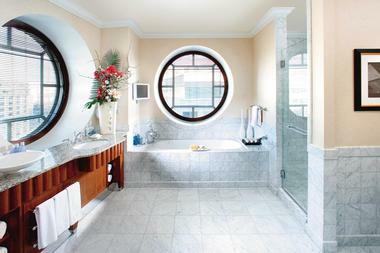 The bathroom has two large round windows with plenty of sunlight. For those getting ready for a wedding or a party, the suite offers a spacious walk-in wardrobe and guest powder room. The Ambassador Suite on the 8th floor overlooks the Jefferson Memorial and the Tidal Basin. It is decorated with a stylish gold, brown and cream color scheme which combines classic American style with Oriental flourishes. 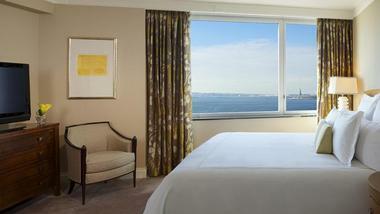 The Presidential Suite is the most spacious and luxurious, offering views of the water and famous landmarks. Located on the 9th floor, this is a favorite with celebrities and Heads of State.The master bedroom has a four-poster bed made from dark wood and a bathroom with a large infinity edge SOK tub, perfect for relaxing after exploring the city. Tu Tu' Tun Lodge, located a few miles from the Pacific Ocean in Oregon, offers romantic ambiance and a selection of outdoor adventures, ideal for couples who enjoy the outdoors. Take a romantic walk through the hotel herb and flower garden, go bird watching, fly fishing and kayaking. The hotel can prepare a picnic basket for your day out. To top off the day, get a relaxing massage followed by a romantic candlelight dinner for two. 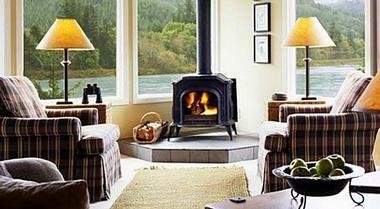 Chinook Suite has incredible views of the river, a cast iron fireplace in the living room, and gallery kitchen. Super-sized suites at Las Ventanas al Paraiso in Mexico offer living areas, rooftop patios, wood-burning fireplaces and Jacuzzis. At night, watch the stars through the telescope that comes with the suite. 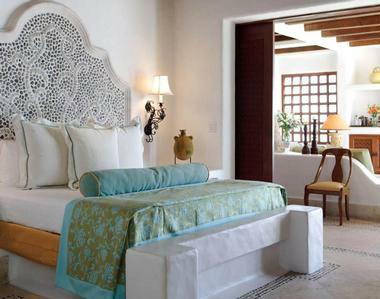 All of the suites measure at least 960 square feet in size and are ideal for a luxurious getaway in Mexico. From the suites at the Ritz-Carlton New York, Battery Park you can enjoy some of the best views of the New York City harbor. Watch the ships through the telescope and dine at the Rise restaurant. New York offers couples many romantic spots to explore, from hidden areas in Central Park to downtown bakeries and cafes. The Point in the Adirondacks is a beautiful all inclusive getaway. The hotel has luxury rooms with scenic views of Saranac Lake, New York, attentive service and innovative cuisine. Each room at the Point is furnished in its own style and since they all have views of the lake, you can't go wrong. However, if you want to have the best, ask for the Boathouse located right over the water. 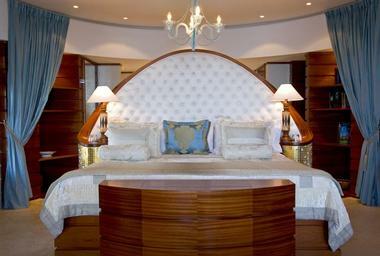 At the center of the Boathouse is a white-canopied bed, accompanied by two twin beds in an alcove. The wrap-around deck outside has two swinging beds suspended from the ceiling where you can curl up together on your honeymoon and enjoy views of the lake. One of the swinging beds faces a huge fireplace which will keep you warm at night. Another alcove has a small refrigerator, fully stocked bar and a table where the honeymooners can have romantic candlelit dinners on vacation. The bathroom at the Boathouse has a double-soaking tub and oversized shower. This room is available from mid-April through October. The bathrooms at Cap Juluca in Anguilla have large tubs and an outdoor relaxation area. Get a suite with a view of the sea and white-sand beaches so that you can remain connected to the surrounding natural beauty of the island. 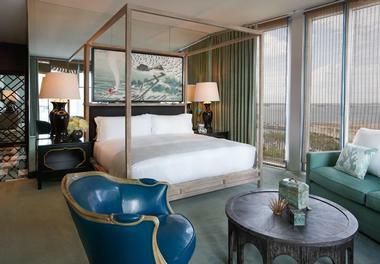 Stylish residences at Viceroy Miami offer spectacular city views and comfortable layouts. Whether you are planning to host a small party in Miami or need extra space to relax on your vacation, the one- and two-bedroom residences at Viceroy Miami are a great choice. Decorated with soothing whites and grays, the residences have private balconies with scenic views. You may also like: 20 Best Things To Do in Miami This Weekend. 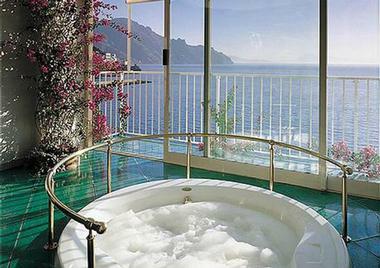 The Amalfi coast in Italy is famous for its dramatic cliff views and Italy has its fair share of romantic hotels. Hotel Santa Caterina offers several suites, including the Follia Amalfitana suite with a sunken Jacuzzi overlooking the sea and a private veranda surrounded by lemon and orange groves. Tsitouras Collection Hotel is a luxury collection of five houses and a villa with attentive service and elegant decor on Santorini, Greece. 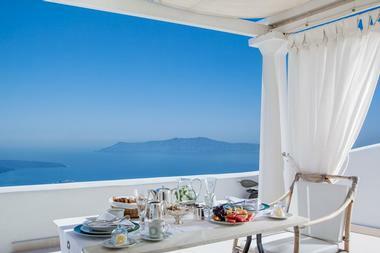 The House of Nurevey features its own veranda with a view of the caldera. The two of you can dine overlooking the sea. The bathroom is decorated with rare Isnik ceramic tiles and has a view of the caldera as well. The TC Villais the largest of all guest accommodations, featuring three double bedrooms with en-suite bathrooms, fully equipped kitchen and a terrace with private pool. Everyone knows that a romantic getaway can easily be ruined by a lack of privacy. You arrive at the romantic hotel of you dreams only to find that there is a convention staying at the hotel and you can't find the peace and quiet you were looking for. (You should check if there are any large groups staying at your first choice hotel before you book.) The solution to a successful trip is a resort where you can be virtually guaranteed some form of privacy. At the Anassa Resort on Cyprus several different room types come with a private balcony or terrace and have either a private plunge pool or a whirlpool on the deck. So if you are the type of person who wants your very own place to relax and unwind on your romantic trip, the suites at the Anassa offer just that. 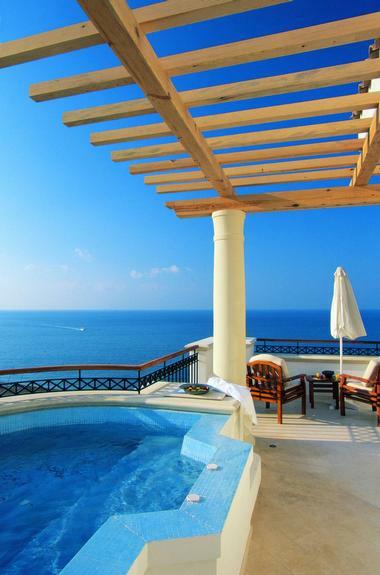 The Adonis Aphrodite suite has some of the most stunning ocean views. The Aether Suite is another good option for couples. Suite St Motitz at Badrutt's Palace is one of the most scenic accommodations in Switzerland, offering spectacular views of the lake and Swiss Alps. The 860-square-foot suite has a comfortable living room decorated in classical style. 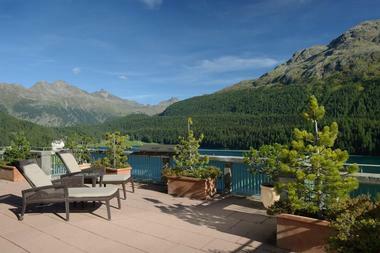 Both the bedroom and the living room overlook Engadin mountains and Lake St. Moritz. Suites with Water Views in Washington D.C.